Uninflated ballon is 13 cm long and 6.5 cm wide, the inflatable diameter is approx. 30.5 cm/ 12 inches, confetti is 2.5 cm/ 1 inch in diameter. Balloons are made of latex, confetti is made of paper, one side is golden, the suitable size confetti can decorate the ballon well. Coordinate with other party supplies for wedding party, anniversary party, birthday party, bridal shower, Christmas party, New Years Eve party or other holiday party. 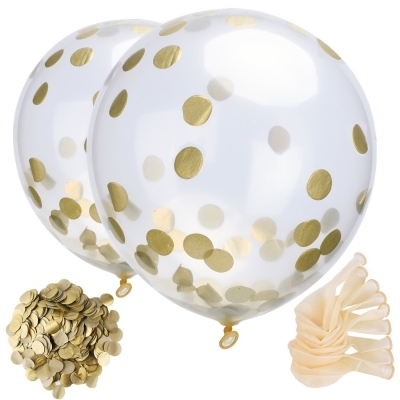 Balloons and confetti are separated, please fill balloons with confetti before inflating, quickly inflate with pump, then shake the confetti balloon or rub on a carpeted surface to get confetti to cling on the sides.